Who needs a wall where the temporary plastic is? 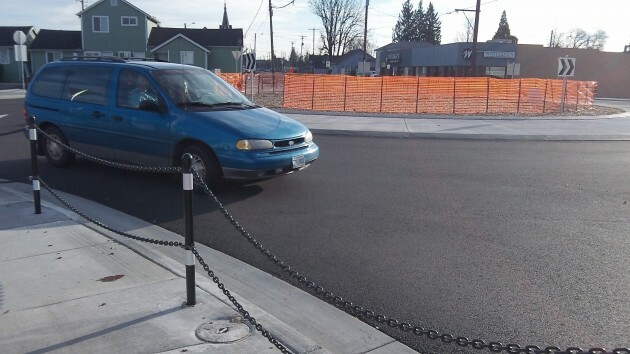 Since it was completed last September, the new roundabout on Albany’s rebuilt Main Street has been tempoarily marked with orange plastic while the city tries to decide whether to get fancy with decorating the place. Nobody asked me, but I would put in a tree and some low-maintenance shrubs and forget about anything that costs tens of thousands of dollars more. It has fallen to the advisory board of the Central Albany Revitalization Area to decide whether to pay for something more elaborate. The board agreed to go ahead with a concept that included a concrete or stone wall around the rounabout island. On the wall, there would be a legend that says something like “Welcome to Albany,” and there may be a reference to the historic districts. The mainremaining issue was the expense, and the city staff was to come up with a specific request on which the CARA board could act. The board’s scheduled meeting in January was canceled because the roundabout treatment was the only major item on the agenda and Public Works had not yet received an estimate of the expense. Now the estimate is at hand, but Public Works didn’t want to give me the amount until it’s presented in a staff report to the CARA bopard. Previously, the board got a guess that the full treatment including wall and lettering might run between $70,000 and $90,000, as opposed to $20,000 for landscaping alone. Whether the actual estimate is higher or lower, it’s far too much for what essentially is a useless bit of vanity construction. Nobody who drives around there needs to be told that he’s in Albany. The wall itself has no legitimate function either. The board was told it keeps drivers from looking across the island, which is supposed to be a good thing because they’re supposed to look to the left to see if any traffic is coming before entering the circle. But having a wall with signage may do the exact opposite of what is wanted. Drivers will look at the sign instead of to the left. And if they don’t look at the sign, why put it there at great expense? In any case, two other Albany roundabouts, on North Albany and Knox Butte roads, function fine with only landscaping. Another thing: Albany’s municipal expenses have been rising faster than its revenue. CARA may not be the main reason, but it gets tax money that otherwise would go to the city general fund. And unrelated to current expenses, voters in May will be asked to approve a bond issue to pay for new police and fire department buildings. in November 2014 the city’s Budget Committee was scrounging for money to increase the general fund. The City Manager told the committee that one potential source was to under levy CARA. In this tax year alone the CARA levy will siphon about $745K from the city’s general fund and $134K from the city’s public safety levy. According to the City Manager’s charts, headcount is down, but total personnel costs are the highest they’ve ever been. The city’s population has leveled off and the growth in property tax assessments is minimal. As you pointed out, it all translates into a general fund that can’t sustain the rising cost of city operations. The shortfalls in the general fund aren’t going away any time soon. So, if the council is serious about this problem, then they shouldn’t just under levy, they should permanently abolish CARA and pay off its debt. Under current conditions, if the council decides to allow a $70-$90K CARA expenditure to landscape this traffic circle, then we’ll have yet another data point showing that the council can’t be trusted with money decisions. How about asking the local garden club to landscape the area. Set a dollar amount to give them and let them take it on for a project. They possibly would maintain it. They have resources to get help on design, plants, and probably help from master gardeners. Everyone comes out in the good and saves the city money. This is the best idea. It would provide a showcase for their work, encouraging others to join perhaps, and allow the city to save maintenance money. Much better than wood chips. I could support just grass, with a sprinkler, and mowing maintenance, but not wood chips. Put the Carousel on it and save both parties money. That is far too sensible! You are dealing with a bureaucracy that feels they need to appoint a committee to decide the best way to tie their shoes. The K.I.S.S. methods I advocate work well for roundabout centers as well. Keep Is Simple. How about one of Jerry Andrus pieces?